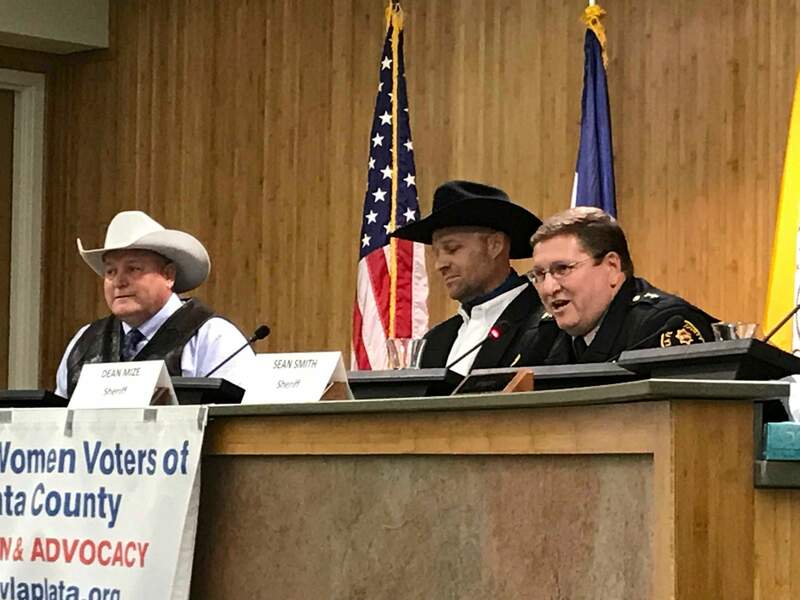 Candidates for La Plata County sheriff Charles Hamby, left, Dean Mize, center, and Sheriff Sean Smith met Monday night in a forum sponsored by the League of Women Voters. Two challengers seeking to be the next La Plata County sheriff criticized turnover, low morale and the treatment of homelessness during the past four years. Candidates for three contested races in La Plata County – sheriff, county commissioner and treasurer – met for the first time Monday in a forum hosted by the La Plata County League of Women Voters. Challengers Charles Hamby, a Republican, and Dean Mize, unaffiliated, said issues under current Sheriff Sean Smith, who was first elected in 2014, need to be improved. Smith said turnover has always been an issue in the Sheriff’s Office, in part because of countywide budget issues that make offering competitive pay difficult. Since Smith took office, about 70 people have left. Smith has said 14 people listed low pay as their reason for leaving. And, he said during former Sheriff Duke Schirard’s last four years, nearly 50 people left. “It’s ... difficult to live in an expensive community when you can’t afford to live,” Smith said. Hamby also called into question Smith’s handling of the homeless population, a common theme during the campaign. Smith did not enforce no-camping laws on a piece of county property where a homeless camp surfaced, arguing courts have made clear it is unconstitutional to prosecute someone for sleeping outside when no alternative exists. Mize said if elected, he would like to identify people within the homeless community who want to work toward obtaining housing and a job, and help them through various programs. Smith said over the past four years, his office has been fiscally responsible while increasing productivity, stepped up emergency disaster response and engaged with the community. “I know these two gentlemen to my right really want to have this job, but I think I’ve earned the right to continue this job,” he said. TreasurerPerformance problems within the Treasurer’s Office was the focus of discussion between incumbent Allison Aichele, a Democrat first elected in 2014, and Republican challenger Colton Black. Since Aichele took the position, audits have found a lack of sufficient internal controls put the county at an increased risk of fraud. As a result, the county is listed in a “high risk” category of running afoul with federal law. These lingering issues, defined as a “material weakness,” have caused the county to pay more in annual audit costs. Black said his first priority would be to address problems identified in the audit. “I think we need to get that definitely addressed quickly,” he said. Aichele said a material weakness finding “sounds like a very bad thing,” but they were explained in the auditors’ report as preventive measures the office needed to implement with its technology and software systems. Aichele said given her office’s staffing level – three full-time people who handle transactions – a material weakness finding is likely unavoidable. She said, however, $20,000 more for an audit is a better return to the taxpayer than $200,000 in salaries for two additional employees that would be required. “That’s not doing the treasurer’s job to protect your funds they’ve been entrusted with,” he said. County commissionerA declining budget, and problems associated with it, were the main questions asked of County Commissioner Brad Blake, a Republican first elected in 2014, and Democratic challenger Clyde Church. Blake said the county is implementing an innovation program to improve efficiency. But road and bridge infrastructure continues to be a problem. Voters have twice rejected requests to raise taxes for road and bridge projects. Church said the county has three options: cut services, change the way it taxes or receive a tax increase. “We have to pay for what we have as a community,” he said. Candidates for commissioner were not asked any questions about the county’s attempt to update its land-use code and possible adoption of zoning laws.